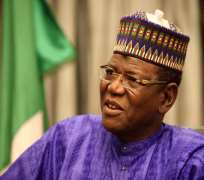 Governor Sule Lamido of Jigawa State has described the sack of the minister for education, Prof. Ruqayyatu Ahmad Rufai along with eight others by President Goodluck Jonathan. The governor said he does not nurse any form of misgiving of the action because it was done within the purview of law. He said whatever factor that led to their removal by President Goodluck was in line with the Nigerian constitution which granted him power to appoint or sack any minister at any given time. The governor stated this yesterday during a grand reception organised in honour of Rufai who came back to her home state after national service. He thanked the president for giving her the opportunity to serve the country as minister of education under his government. According to the governor, the people of the state were proud of Rufai for performing wonderfully as a minister. In her speech during the occasion organised by the state chapter of the Peoples Democratic Party (PDP) in her honour, Prof. Rufai expressed gratitude to Almighty God for giving her good health and wisdom to see the beginning and end of her service as a minister.